Lucy Zodion Single Door feeder pillars are manufactured from galvanised steel (with optional painted versions) for LV power distribution and control – both mild and stainless steel options are available from the Fortress range with choice of hot dip galvanised finish or hot dip galvanising with additional protective paint coating according to customer specification. 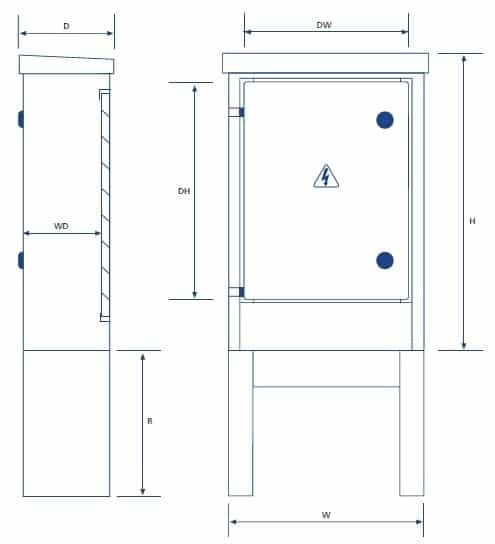 Single Door Feeder Pillars are available available in 6 sizes: 310mm – 1100mm widths with 3mm or 5mm feeder pillar shell thickness (stainless steel option). 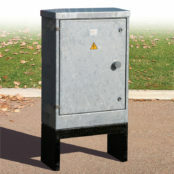 Larger sizes are available in the double-door range with maximum above ground height of 1600mm and width of 2250mm. 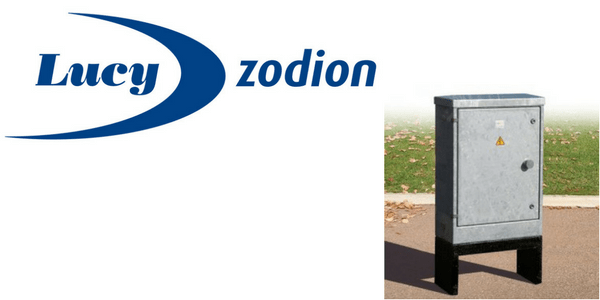 The ordering code for Lucy Zodion Single Door feeder pillars from the Fortress range is comprised of 4 sections – all dimensions are in mm. This is a Fortress range Single Door feeder pillar manufactured by Lucy Zodion – pillar size is 06, material is hot dip galvanised steel, 3mm thickness, with hasp and staple, 13 Amp socket kit and lighting kit.